If you are looking for the best cold pressed Rosehip oil for your face, you probably already know that Rosehip oil is great for various skin issues and conditions. Not only is it good for hydrating your face, helping it deal with blemishes including acne breakouts and reducing fine lines and wrinkles, but it also helps keep your skin better conditioned with an even skin tone, healthy looking and glowing. Most rosehip oils come from the seeds of roses grown in Chile. Rosehip is filled with minerals, Omegas, vitamins and other antioxidants. When purchasing a good rosehip oil choose one that is organic, highly concentrated and is free of artificial colors, fragrances and other additives. 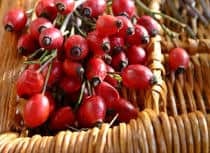 Rosehip oil can be used by itself, added to your favorite creams or lotions, or used in making your own skin care products and soaps. So, here is a look at some of the best cold pressed rosehip oils on today’s market. 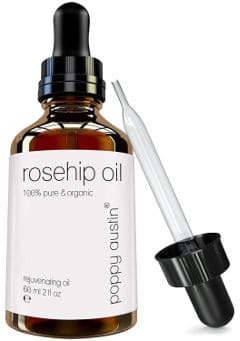 Poppy Austin Rosehip Oil is only pure rosehip oil that is responsibly sourced and made by hand using the finest organic rosa rubiginosa seeds which are triple filtered to achieve maximum purification. The cold process is done with traditional extraction techniques. This and the fact that the company has very strict qualification standards with only the best batches being approved for sale makes this product so special. According to the company, this oil is great for giving your skin a youthful glow, reducing laugh lines and crow´s feet, minimizing age spots and hyper pigmentation as well as making your skin supple, moist, plump and soft without leaving any oily residue. 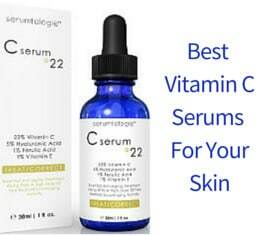 It is also recommended for sun damaged skin and in general skin suffering from extreme weather conditions. What is So Special about Poppy Austin Rosehip Oil? Most of all, Poppy Austin Company promises that you will experience visible skin improvements in as little as 2 days after the first use. I would say that with a good quality Rosehip Oil, these changes can appear even right after you apply and massage it into your skin. Reviews for the Poppy Austin Rosehip Oil are great. Poppy Austin is a reputable and trustworthy company that creates high quality skincare products which have lots of faithful fans. About their rosehip oil, users say that it works great to improve the total looks of their skin, offering positive long term changes to it. More specifically, it makes their skin brighter, supple, plump and with less visible fine lines. It is lightweight and hydrates wonderfully the skin while also fading dark spots especially when it is combined with a vitamin C serum, diminishing acne as well as acne scars, and even dealing with dark circles under eyes. The pores look smaller and the skin feels more elastic after using this oil. Really, there are no negative complaints about this product apart from the fact that for few users it takes a little more time to see results although I would say that it also all depends on the condition of your skin, what your expectations are and how well you can determine what your skin really needs or not. 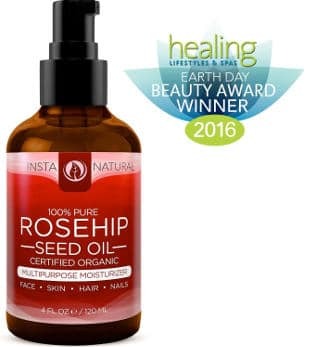 The InstaNatural organic Rosehip seed oil comes in a four ounce container with a pump. It is cold pressed, 100% pure, imported form Chili and bottled in the USA. According to the InstaNatural company, it is good for several skin issues or conditions such as fine lines, wrinkles, dark spots, scars and stretch marks. It has excellent hydrating properties and not only does it heal blemishes but it also gets rid of dry patches on your skin. In addition, it reverses the damaging effects of excessive sun exposure and is deeply nourishing. The product comes with a money back guarantee. Reviews for the InstaNatural Rosehip Seed Oil are very positive. 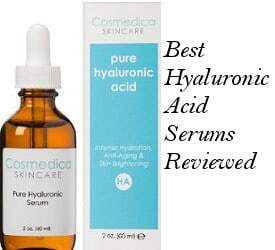 Users state that it has helped to reduce acne scars, clear up existing blemishes and diminish fine lines. The majority of the people say that they have experienced no breakout after using this oil. They also find the pump dispenser extremely handy and like that fact that the product absorbs quickly and leaves their skin feeling smooth. The Majestic Pure Rosehip Oil is 100% pure and cold pressed. It comes in a 4 ounce container with an eye dropper dispenser. According to the manufacturer, this Rosehip oil firms the skin and keeps it moisturized as well as supple while also combating fine lines. It can be used in a variety of skin conditions such as stretch marks, scars, dermatitis, eczema and acne. It also helps damaged hair and gives body and shine to colored hair. The company suggests that you will see positive results in about 3 months after first applying it on your skin twice every day. 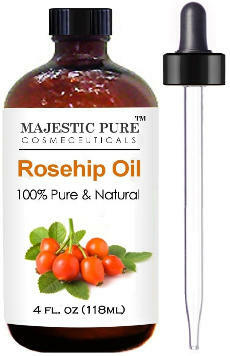 The Majestic Pure Rosehip Oil ratings couldn’t be much better. Users state that they like the fact that it is rich in vitamins and anti-oxidants. They say it absorbs quickly, works great to improve the overall health of their skin and nails and even helps to heal cracked feet. It relieves itch and results in a silky and smooth skin. 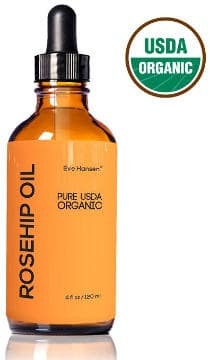 The Eve Hansen Rosehip oil is USDA certified organic. It comes from Chile and is bottled in the USA in an FDA Registered Facility. It is contained in a 4 ounce amber glass bottle container which prevents it from spoiling and comes with a year money back guarantee. The company recommends it for dry skin, wrinkles, stretch marks, acne scars and even for lips, cuticles, nails and heels. It is non greasy and easily absorbable. Ratings for this product are very good with users reporting that it leaves their skin smooth and creamy. It absorbs quickly, makes wrinkles less visible and hydrates the skin well. According to them, it also lightens dark spots, reduces stretch marks and brightens their skin. 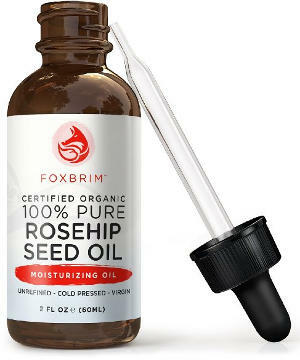 The Foxbrim rosehip seed oil is unrefined, cold pressed as well as USDA and EcoCert certified organic. 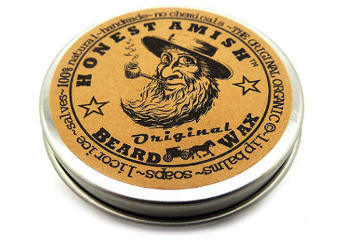 It gets cold pressed in very small batches and is backed by the company´s money back guarantee. It works great for dull, dry or irritated skin, minimizing wrinkles and fine lines, fading discoloration and age spots as well as reducing scars, blemishes and burns. It is also good for dry and brittle hair. Ratings for this product are very positive. Users review that it hydrates their skin, hair and scalp very well. It helps to treat acne, relieves dry skin as well as itching and reduces eczema symptoms. It is non-greasy, absorbs quickly into the skin and is great for mature skin. 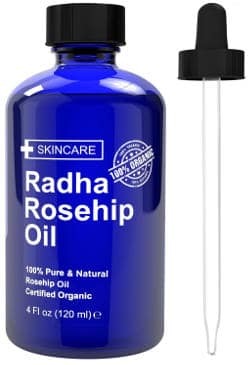 Radha Beauty Rosehip Oil comes in a 4 ounce glass bottle with an eye dropper dispenser. It is an organic, cold pressed virgin oil that does not contain any fillers and is cruelty free. The company recommends it for sun spots, photo aging, stretch marks, dry skin and acne scars but does not recommend it for active acne. It also comes with a lifetime money back guarantee and is very popular among users. Most people feel that this oil really provides hydration for their face and other parts of their skin. It improves Eczema symptoms and absorbs quickly. Most of them say that using this product results in glowing skin and actually improves the texture of their skin while also reducing redness. Several users have also mentioned that they used it on their hair, leaving it shining and more hydrated. A disadvantage that few users found was that it stained their clothes, but this can easily be prevented if you make sure that you massage the oil well into your skin and let it absorb before covering the area with any piece of cloth. All in all, if you are looking for the best cold pressed Rosehip oil for your face and other parts of your skin but also for your hair and nails, then the above selection of organic rosehip oils will help you choose the one that will become an asset to your skin care regime.